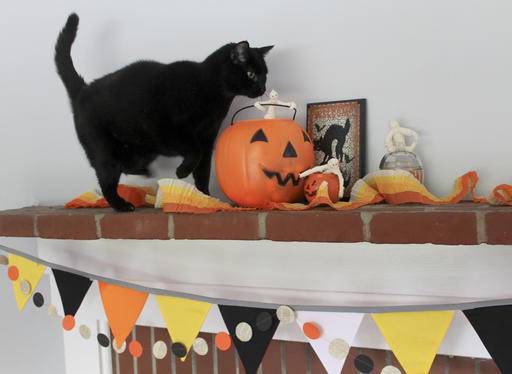 In this Oct. 2, 2016 photo, a black cat becomes part of the decor in Hopkinton, N.H. 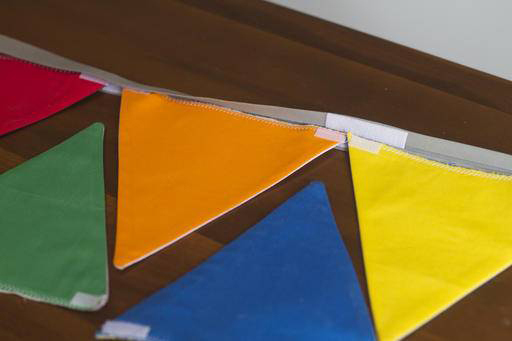 The pennants on this colorful banner are held in place with bits of hook-and-loop tape, making it easy to transform the banner for each holiday in turn. 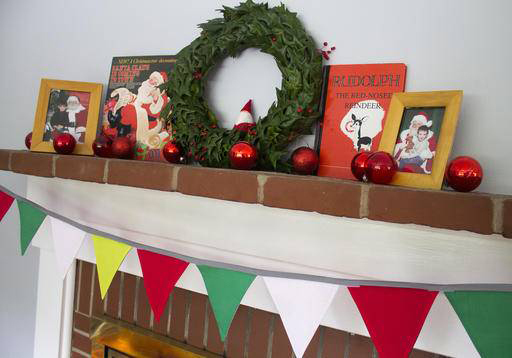 A banner made with reversible, removable fabric pennants makes it easy to update your decor with each season and holiday. Create a template for the pennants out of cardboard or cardstock by drawing a triangle that measures 6 1/2 inches across the base and 6 1/2 inches tall. CONCORD, N.H. (AP) – I recently moved to a new house that is less than half the size of my former home, but the new place has one key feature the old one lacked: a fireplace. Or, more specifically, a fireplace mantel to decorate. OGDEN, Utah (AP) – Biologists in Utah are working to save native boreal toads from extinction in the face of the destruction of its habitat by humans and competition from invasive species like bullfrogs. CAPE CANAVERAL, Fla. (AP) – Total solar eclipses occur every year or two or three, often in the middle of nowhere like the South Pacific or Antarctic. What makes the Aug. 21 eclipse so special is that it will cut diagonally across the entire United States. Mary Agnes Boni secured the open seat on the Humboldt County Library Board at the Aug. 7 County Commission meeting. She and Brandie Pettis competed for the single open seat on the board. However, Pettis did not appear at the meeting. Shane Bell grew up on a ranch in Paradise Valley, Humboldt County. He decided during his senior year of high school that he wanted a law degree and he wanted to use it to help protect the ranching way of life. 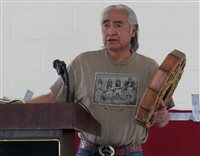 The Fort McDermitt Paiute Shoshone Tribe held a storytelling event Aug. 5-6 in the reservation’s Youth Center. The event included three open-mic sessions for participants to share their stories. Attendees came from all over northwestern Nevada and California to listen and share. Meals and breaks between sessions encouraged conversation among attendees and participants. 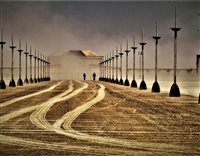 Congressman Mark Amodei recently informed county leaders that things are “going smoothly” with the Burning Man festival at the federal level. The Bureau of Land Management recently issued a special recreation permit for the event that opens August 27 in the far northwest corner of Pershing County. Pershing County Sheriff Jerry Allen told county leaders things are not going that well from his point of view. 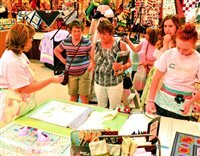 Quilters from all over showed off their handiwork at the Battle Mountain Civic Center on August 5. The Dunes Fire burned in Slumbering Hills, about 20 miles northwest of Winnemucca. 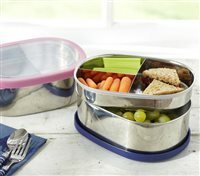 It was discovered at 1:21 p.m. Tuesday. Sensei Kenneth Wentz and his wife Juanita Wentz recently took their 10 competitors to Laughlin and brought back 11 trophies and two medals. Wentz has 43 years of teaching experience, and has earned world championships, proving his method.